One of the many great things about 1911s is the endless options for customization that they open up for you. Probably the top candidate for customization is the sights. As with so much in the firearms market, the possibilities are endless. Follow our guide for the best 1911 sights on the market today. There are a few categories to choose from depending on what you're looking for. While this article focuses on open sights, it is good to know what the alternatives are, so you can make an informed decision. Note that although we have front and rear sights in separate categories below, they often come as a set. The front sight is attached to the front of your 1911 slide and usually appears as a black post when acquiring a sight picture. This post design can be modified in various ways to make it easier to quickly acquire your target. Sometimes the post is simply painted white or features a white dot. Other times, front sights include a tritium insert that glows in the dark. This is often ringed in white paint. 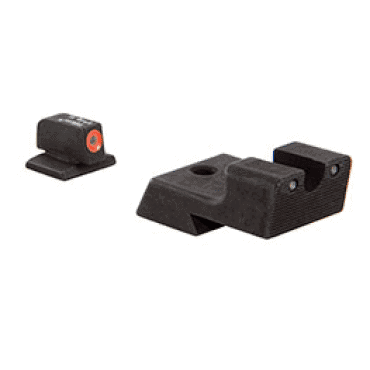 Fiber optic front sights are also a very popular option as they offer quick target acquisition. This makes them popular in target competitions. Rear open sights are simply those attached to the rear of your 1911 slide. They come in myriad shapes and sizes. Usually, front and rear sights come as a set optimized to be used together, such as with the popular three-dot arrangement. With three-dot sights, you line up a dot on the front sight with two identical dots on the rear. These often come with tritium for nighttime illumination, usually ringed with light paint to provide contrast during the daytime. 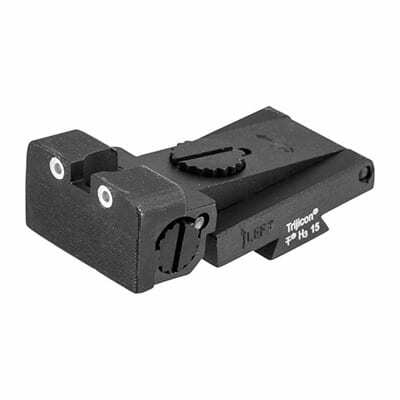 Fiber optic three-dot sights are also popular. Other rear sights have a simple notch or a dovetail. These can be marked with paint in various ways to aid in lining the front and rear sights up. Reflex sights include both red dot sights and holographic sights. In both varieties, an image, dot, or reticle is projected onto a curved piece of glass. Unlike with traditional sights, the point of aim indicated will remain true no matter where the shooter's eye is located in relation to the sight. The technology behind red dot sights is much simpler than that behind holographics. In the latter case, the sight image is projected away from the shooter's eye, making it appear to be more or less on the same plane as the target. They also offer the finest aiming points on the market, at about 1 MOA. EOTech dominates the market for holographic sights and they don't come cheap. Red dot is the term for a laser projected onto a curved piece of glass. They offer no magnification, but relatively quick and easy both-eyes-open target acquisition no matter where exactly your eye is placed relative to the sight. Red dot sights actually come in a range of colors including red, green, and orange. They are a relatively simple technology, offer very long battery life, and cost much less than holographic sights. They are a lot higher profile than traditional open sights, which may be an issue with holstering and concealed carry. A ghost ring is a type of aperture sight. Apertures are usually found on back-up iron sights on rifles, but they can also be used on handguns. A ghost ring is basically just an aperture that is much larger in diameter than the standard pin-hole style. This reduces long-range accuracy, which is inconsequential on a handgun. It increases the speed and ease of target acquisition. Although ghost rings are uncommon on handguns and may take getting used to, as they don't haze out the same way as on a rifle. A fiber optic front sight is a good option with a ghost ring. Choice of sights is one of the areas of firearms where personal preference plays the largest role. As usually, more reputable manufacturers generally offer products with better build quality and overall design. One consideration is how snag-proof these are, particularly if you intend to carry your 1911 concealed. You want some that aren't going to snag on your clothing, preventing you from making a quick draw and quick target acquisition. Fiber optic options offer great contrast and target acquisition, but they are not always very robustly built. If you just need something rock-solid, a standard painted steel open sight may be for you. If you think illumination for nighttime shooting is a necessity, consider tritium. Some sights, particularly target modes, offer easy adjustments for windage and elevation. Otherwise, you will have to mess around with tools to sight-in your gun. For most of us, this is okay, we only sight-in once in a while and the accuracy is sufficient for practical purposes. For competitive shooting, more adjustability may be needed. With all the options out there, it can seem impossible to choose. Here is our list of the best 1911 sights. Whatever your personal taste, there's a great product here for you. Trijicon started out in 1981 in Michigan. Trijicon is a market leader in reflex sights, fiber optic sights, and sights using tritium for nighttime visibility. Their name has earned its place in firearm history with the ACOG series of fixed magnification sights with phosphorescent reticles popular with the military. The design of the 1911 sight addresses the needs of tactical hunters. It incorporates a three-dot design with green tritium lamp inserts. These inserts are warrantied for twelve years from the date of manufacture. The aiming point on the front is ringed in photoluminescent paint for clear daytime visibility. Besides the two tritium inserts, the rear features a wide U-shaped notch for greater visibility and faster front sight acquisition, even in low light conditions. As a bonus design feature, the front surface of the rear sight is steeply hooked to facilitate emergency slide operation with one hand. This is an excellent set for tactical purposes. It is especially ideal for nighttime use in an urban environment. Trijicon is definitely a company that knows what it's doing and puts its products through thorough review and testing. The best features of this set are the tritium inserts and quick front sight acquisition. The one-handed racking hook is a nice touch, too. Crimson Trace is a dedicated laser sight manufacturer that started out in 1994 in Oregon. They are currently owned by Smith & Wesson. Laser sights actually started out as a prop in the movie The Terminator, but have achieved widespread popular application since the film came out in the mid-80s. Early models were bulky, but progress has brought us designs such as this one, integrated seamlessly into a dedicated 1911's pistol grip. This product uses two #2025 batteries to offer over four hours of constant use. The proprietary Instinctive Activation feature automatically activates the laser when you bring your 1911 up into a natural firing grip. It has a rubber, over-molded activation button integrated into an ergonomic and aggressively robust G10 side panel. The unit is factory sighted to fifty feet but offers user-adjustable windage and elevation. The dot size is about half an inch at fifty feet. This product is compatible with any 1911 with grip screws measuring 3 1/16 inches apart. It is fully-compatible with ambidextrous safeties and is covered by a three-year limited warranty. From their big-screen beginnings, laser sights have found adoption in various tactical contexts. They can also be great training aids. Whatever your use case, the Crimson Trace is an excellent choice. Its top features include the fine dot size and the ergonomic, durable grip. Sometimes we find ourselves happy with our rear sights but are not so sure about the front one. Luckily, plenty of options for a modular update exist. If you expect to shoot a lot in low light conditions, tritium can literally be a lifesaver. Novak has been producing great products in West Virginia since 1985. This front sight is a low-profile unit. Due to its short length, it accumulates less residue on its face during firing. It also offers a slick and attractive profile for any 1911. A side benefit is an easy, snag-free draw. The sight picture features a bright tritium insert surrounded by a high-visibility white ring. Versions without the white ring are also available as some shooters find them distracting, but we recommend sticking with the ring, as you are better off focusing on your front sight. This product is made of pre-heat-treated 4140 American steel which has been precision CNC machined in the U.S.A. and finished with black nitride. It features a front roll pin hole for security and an extra-reliable position. This is a great tritium sight in a classic low-profile design. The top features are the tritium insert and the optional white ring around it. The low-profile design will also be appealing to some shooters. It is an all-around solid choice. Kensight has been around since 1997 and specializes in high-end target and precision night sights. This rear sight brings together two design goals that you don't usually find together. It is intended to be both a solid, low-printing concealed carry option and an easily adjustable target-style sight. 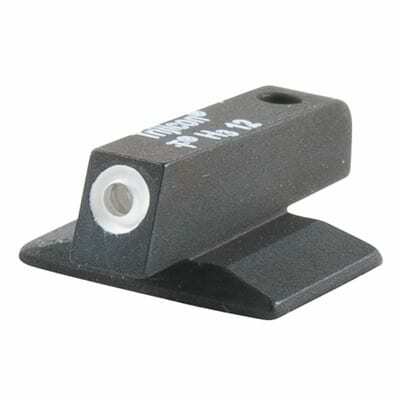 Put simply, it is a target sight with rounded corners on the blade and beveled edges on the base to greatly reduce snag. The rear blade contains two Trijicon tritium lamp inserts in either green or yellow. These are ringed in white outlines for better visibility in the daylight. The rear blade is serrated to break up light reflection for enhanced sight acquisition. The body is EDM machined from 4140 chrome-moly steel. This is then heat-treated and vacuum-tempered to retain extra-tight machining tolerances. The windage and elevation knobs adjust with precise clicks, offering you consistent and predictable changes in aim point. 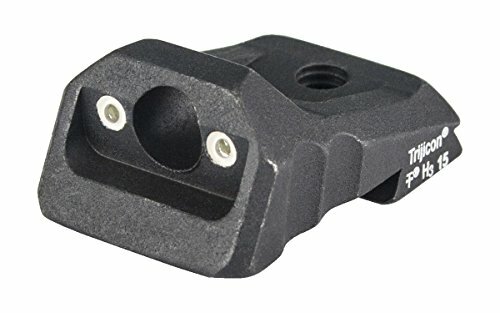 If you love the easy adjustability of a target sight, but worry that it won't work effectively for concealed carry, this rear sight is for you. The top features are the tritium inserts, beveled edges, and the precise clicks of the adjustment knobs. This is a top-quality item for serious shooters and is great for law enforcement applications. Burris has been around a long time and is currently owned by Beretta. Red dot sights are my personal preference, as the speed of target acquisition with them is hard to beat. I also prefer open red dots such as this one over the tube design, as they provide less obstruction of your view down range. This model provides a 4 MOA dot, which is on the finer end of the spectrum for red dots. This might seem like an imprecise aim point, but it is a lot better than what open sights have to offer. This features an automatic brightness sensor that adjusts the dot intensity according to ambient light conditions. The lack of magnification lets you acquire your target with both eyes open for greater situational awareness. The elevation adjustment gives you a 115 MOA range to play with while you have an 86 MOA range with windage. This sight window has a field of view of 190 feet wide at 100 yards. The high-grade optical glass is multi-coated for the best possible clarity, brightness, durability, and glare elimination. 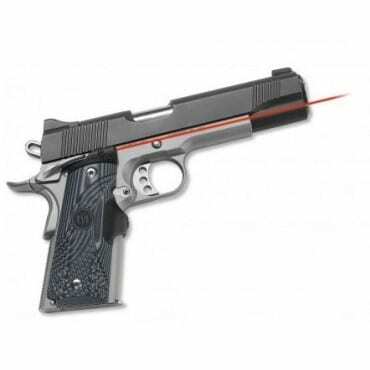 It is compact and lightweight so it won't affect the balance or handling of your 1911. The top features are the lifetime warranty, fine dot size, and the automatic brightness adjustment. If you want to try it out on another firearm, no problem, it will mount on anything with a Picatinny rail. The all-metal body is waterproof, shockproof, and recoil-proof, tested to withstand up to 1000 Gs. It is covered by a lifetime warranty. 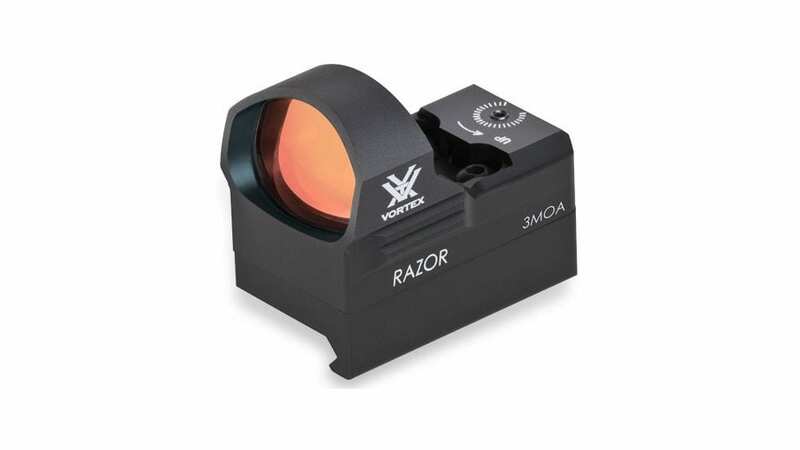 Vortex has been around for nearly twenty years, and in that time they have captured a huge market share from their competitors in the optics field. They are the only company besides EOTech to produce a holographic sight and they offer one of the best warranties in the business. This is a sweet little red dot sight from Vortex with all the features you would expect. It has a waterproof and shockproof O-ring sealed chassis supporting glass with protective multi-coating. The glass also has great brightness and anti-reflective properties. This can remain on the highest brightness setting for one year using a single CR2032 battery. As with all red dot sights, this unit offers unlimited eye relief for the quickest possible target acquisition. The Picatinny mount allows you to switch this between almost any firearms in your possession. You have the option of selecting between a 3 MOA and a 6 MOA dot size with nine brightness settings. All this is backed up by Vortex's unlimited lifetime warranty. Vortex has carved out a huge slice of the market for itself for a reason. Their excellent warranty lets you pull the trigger with peace of mind. The top features are the choice of dot size, the long battery life, and all the general benefits a red dot has to offer. Ghost rings work a bit differently on handguns than they do on long guns. The ring will not be near enough to your eye to haze out as it would on a rifle, but it can still offer a quick and easy method of target acquisition. The geometry of a large aperture is natural for the human eye to aim. If you haven't tried a ghost ring on a handgun, it takes getting used to, but many shooters swear by them. If they didn't, a company like Kimber wouldn't waste their time producing such sights. This is a high-quality engineered rear sight that looks very cool on any 1911. All the edges are smooth and snag-proof. Kimber has included two green Trijicon tritium inserts on either side of the ghost ring, both ringed with a white outline to help with target acquisition in the daylight. This ghost ring sight comes with a retaining screw and a wrench. It is made in the USA and is intended for all Kimber models that accept fixed sights. Kimber is a legendary name in custom 1911s and I am personally a big fan of their products. The top features of this ghost ring sight are the white-outlined tritium inserts, easy installation, and the smooth, snag-free edges. Getting the right sight can make all the difference in your shooting. If you find your sights to be comfortable and easy to get on target you will enjoy shooting more. The more you enjoy shooting, the more you will practice and the better you will become. We hope you enjoyed our list of the best 1911 sights and wish you fun and safe shooting. As choosing sights can be one of the most confusing parts of gun ownership, we get a lot of questions on this topic. Reflex sights seem to still be a mystery to many potential buyers out there. Here are some of the most common questions we get on such sights. What is the Difference Between a Red Dot and Reflex Sight? Red dot sights are one kind of reflex sight. Most red dots are reflex type sights. Red dot refers to any technology that uses an illuminated red dot reticle. However, they can also use a green dot or crosshair and still be considered a red dot. Both red dot and reflex can be used interchangeably to describe a specific product. This type projects an aiming point forward and reflects it back so you see a red dot on your target. What is the Difference Between a Red Dot Sight and a Holographic Sight? Red dot sights are far cheaper and simpler technologically than holographic sights. The difference is in how the sight image is projected onto the curved piece of glass. To understand why holographic sights are so much better and more expensive, you really have to try using both, they are just easier on the eye and easier to acquire a target. However, this type of sight comes with a significant price increase to match. Red dot sights offer an aiming point usually between four to seven MOA, while a holographic sight gives you an aiming point of about 1 MOA, the finest on the market. Holographic sights also appear to be on the same sight plane as the target, making aiming much more natural than with any other option. All holographic sights are produced by EOTech, except for one option from Vortex. 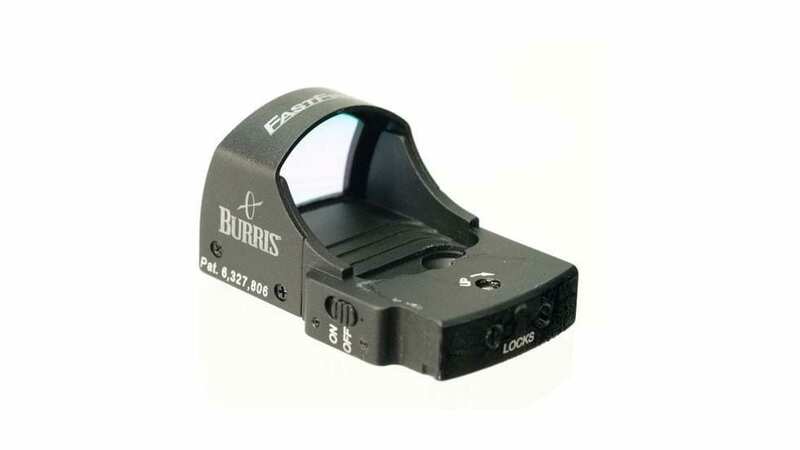 A red dot sight projects a laser through an aperture onto a semi-reflective curved piece of glass. The curve allows the visible point of the laser to appear to be on target no matter where your eye is located in relation to the sight.